River Parks offers Basecamp Turkey Mt. 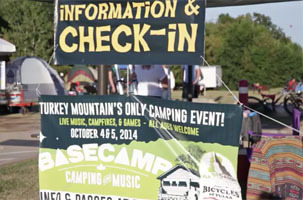 The annual Tulsa family camping adventure Basecamp brings wilderness to the metro Saturday September 30 at Turkey Mountain in Tulsa’s River Parks. Arrive early for the family fun and games and fabulous entertainment. Stake your spot at the amphitheater to enjoy live music from 4-11pm. 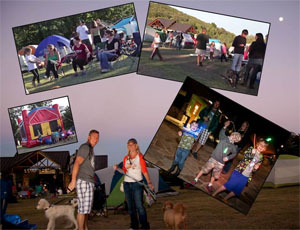 BaseCamp is a relaxed, family-friendly atmosphere with entertainment all ages. A beloved part of the event is the “Glow Hike” with thousands of glow-sticks down the trails to glow your way walking through the woods. Very limited quantities of EXCLUSIVE discounted ticket offers are available this year; private pavilion passes, and much more. 100% of the proceeds will benefit Tulsa River Parks Authority. There are limited numbers of camping passes that will be sold, so get yours before they are gone! Also available through “Dern Fine Camping” is an option to contract Homma Camp Co to set everything up for you and all you have to do is show up and enjoy! For more details check out their website and ticket page for details on pricing. Camp Setup begins at 2 pm for Early Arrival permit holders and 4pm for all others. Each camping pass is for 1 tent and up to 4 persons per tent. Personal grills, fireworks, glass containers, weapons, illegal substances, campers or trailers, car camping and grumpy pants, according to organizers, are not permitted. Grumpy shirts and shoes are also discouraged. Quite Time: 11pm to sunrise. Tulsa Yoga Quest and Rachel Calvert will be providing sunrise yoga at 8am Sunday morning. A: Per River Parks Authority rules, there is no loudness after 11 pm and what a perfect time for beddy-bye. We STRICTLY enforce this policy. We don’t make you go to sleep, you just can’t be loud and noisy because others are trying to sleep. Hushed tones and sleepy sleep are a priority. Security guards will be patrolling throughout the night to make sure everyone is safe and sound. Quiet time ends at sunrise because we just can’t stop people from waking up. So, if you’re a late sleeper, bring earplugs and an eye mask! A: Heck NO! 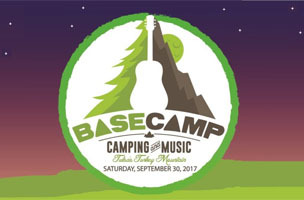 BaseCamp is a family and friends event. Our focus is a camping festival with cool music that families or groups of friends can come to that will all have a relaxed time. Definitely, watch the video above to get the best idea of what the festival will be like! Click here for the BaseCamp page at the River Parks web site. This entry was posted in Local, Out & About on July 20, 2017 by admin.